Premise- Eight players compete and are divided into two groups of four. Each group will be asked a toss-up question with a numerical answer. The player closest to the correct answer gets to choose the first answer to the next question. The next player closest gets to choose the second answer, and so on. Afterward, each group will be asked a question with four answers (three right and one wrong). The players who choose the correct answers will stay in the game, while the player who chose the wrong answer is eliminated from the game in one of 101 various ways, from being dropped off by a semi-truck to being yanked off a dock while tied to a speedboat. Four questions are played until two players are left in each group. In the final round, the final four players are asked a toss-up question followed one final question. This time, the question has four possible answers and only one correct answer. The player that chooses the correct answer wins the game and $50,000, while the other three players are dropped from a ten-story tower into a pool of water. For some strange reason, it seems like we are seeing more “Russian Roulette-type” game shows within the past two years, such as Who’s Still Standing and Downfall. But 101 Ways takes the concept of the once popular GSN game show to a whole new level. 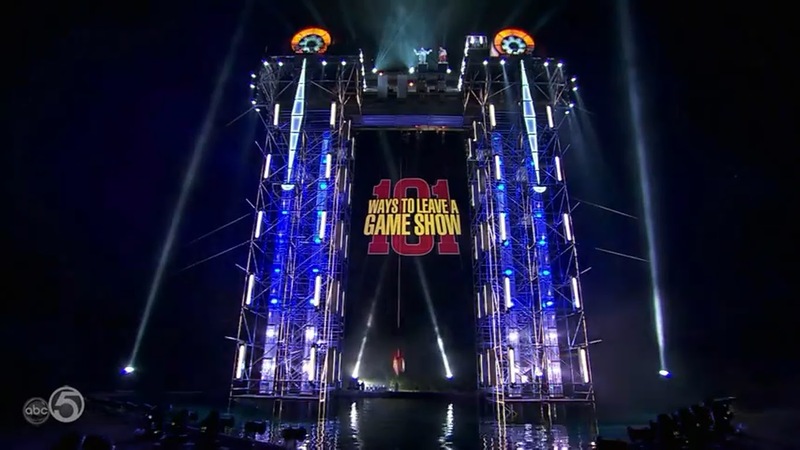 From what I’ve seen in the first episode, the various game show exits in this show are a lot more frightening like being strapped to the top of a 1940s style airplane wing and being flown away from the game or being dropped from a ten-story tower, freefall style. I also like that the U.S. version isn’t too different from the original version, with some of the exceptions being players standing in the tower’s studio for the trivia rounds and the surprise “Emergency Exit” round in the original version. The only thing I wish the U.S. version would add are the ironically happy and cheerful songs during the replays of the person leaving the show as on U.K. version. Those replays with the added music always made me laugh. As far as the host, Jeff Stuphen is an excellent candidate to host this show. Stuphen is as mischievous and devious as Geoff Edwards was on Treasure Hunt. Before he pushes a button or pulls a lever to eject a player from the game and he occasionally likes to stir conflict among players and encourages it in a humorous, non-exploitative way. As far as the trivia aspect of the show, I have seen a lot of complaints concerning the number of questions asked on the show. I don’t have a huge problem with this considering that the selling point of this show are the multiple, exciting (and sometimes dangerous) ways that a contestant could leave the show. Overall, this is a pretty cool summer game show. In the show’s season premiere, 101 Ways fared better than the Sneak Peek episode of Wipeout with 5.57 million viewers. Even though I wish that Downfall was renewed for a second season, this is still a good game show to match up with Wipeout.